He's been called the best in the world at the mental game of tennis. Brad Gilbert's strokes may not be pretty, but looks aren't everything. He has beaten the tour's biggest names - all by playing his "ugly" game. Now, in Winning Ugly, Gilbert teaches recreational players how to win more often without necessarily even changing their strokes. The key to success, he says, is to become a better thinking player - to recognize, analyze, and capitalize. That means out-thinking opponents before, during, and after a match - forcing him or her to play your game. Unstoppable - But at what cost? Agassi's incredibly rigorous training begins when he is just a child. By the age of 13, he is banished to a Florida tennis camp that feels like a prison camp. Lonely, scared, a ninth-grade dropout, he rebels in ways that will soon make him a 1980s icon. He dyes his hair, pierces his ears, dresses like a punk rocker. By the time he turns pro at 16, his new look promises to change tennis forever, as does his lightning-fast return. And yet, despite his raw talent, he struggles early on. We feel his confusion as he loses to the world's best, his greater confusion as he starts to win. After stumbling in three Grand Slam finals, Agassi shocks the world, and himself, by capturing the 1992 Wimbledon. Overnight, he becomes a fan favorite and a media target. Agassi brings a near-photographic memory to every pivotal match and every relationship. Never before has the inner game of tennis and the outer game of fame been so precisely limned. Alongside vivid portraits of rivals from several generations - Jimmy Connors, Pete Sampras, Roger Federer - Agassi gives unstinting accounts of his brief time with Barbra Streisand and his doomed marriage to Brooke Shields. He reveals a shattering loss of confidence. And he recounts his spectacular resurrection, a comeback climaxing with his epic run at the 1999 French Open and his march to become the oldest man ever ranked number one. With its breakneck tempo and raw candor, Open will be listened to and cherished for years. A treat for ardent fans, it will also captivate listeners who know nothing about tennis. Like Agassi's game, it sets a new standard for grace, style, speed, and power. I love reading sports biographies. But most are droll re-tellings of the players highlights. Once in a while you'll get lucky and find one that's inciteful, and entertaining. This one does both! 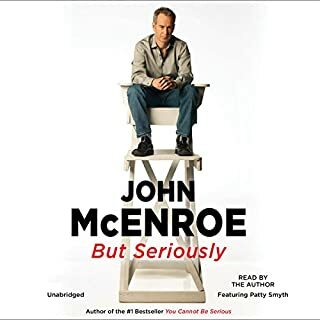 J.R.Moehringer does an awesome job of telling a story: what motivates Andre, how his view of tennis was formed, and his struggles for finding motivation. There's a love story (Steffi, not Brooke), and some very funny parts that will make you laugh out loud. You get Andre's account of his major and formative tennis matches. 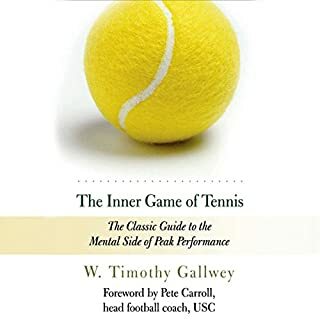 Don't worry, it's not about every single serve and volley; you get the critical parts, and you get a sense of how mentally taxing the game of tennis really is. You also find out how physical it is. I can't wait to see replays of the old Agassi matches and remembering how Andre described the match. I just saw the Agassi-Baghdatis US Open match highlights a few nights ago. Erik Davies does a tremendous job with his inflections, and doing "voices" of the different characters in the book. You know who is speaking by how Erik talks. I wonder if he listened to the audio tapes of the original interviews to get an idea of how to speak in the first person as if Andre read the book himself. Andre doesn't hold back when talking about his rivals - the ones he likes and respects, and the ones he doesn't. If you're a "sports parent", you *MUST* read this book, no matter the sport. I wonder how many of us parents will be a little more aware of how we handle our kids in their sport(s) after hearing Andre's story about his Dad. Just a heads up: Andre does drop a few F-bombs, so be forwarned. It doesn't take away from the story, but you need to know if you plan on letting your children hear the story. Download this book and you will enjoy it, no matter what your preconceived opinions of Andre Agassi are. I had this book in my wish list for two years and without a doubt, that was a huge mistake. This book was outstanding! Not a huge tennis fan but this is such a great story. I loved hearing about Andre when he was little. I loved hearing about his rise to the tennis ranks and I loved listening to how he remained on top. I even loved hearing about his personal relationships as well. 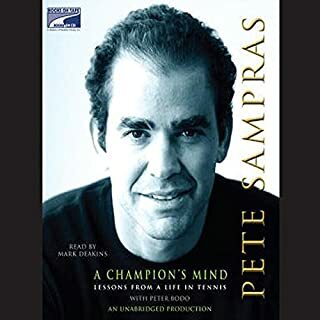 Most impressively, the narrator did a tremendous job and the book is written in such a great way, it made me wonder if Agassi actuallly did write this. If so, he writing ability may be as good as his tennis talents! Two thumbs up and highly recommended!!! I have always been a tennis fan, loved watching Agassi play...this book reveals the real Agassi. I downloaded it and could not stop listening. My only complaint, when the narrator was speaking as a female...it kind of bugged me!! Agassi is the most insightful, honest (or seemingly honest) autobiographer I've ever run into. The book is fascinating, start to finish. On top of that, it's the best non-fiction book I've read in 5 years. It's not his life story as he would have wanted it to be, or the life story that he thought would sell the best, or a hagiography. It's his story exactly as it was, in unvarnished, penetrating -- and compelling -- detail. It's spectacular. P.S. Pete Sampras and Brooke Shields won't like it. P.S.S. You'll cry 5 or 6 times. This was a great autobiography. He is so OPEN and to the benefit of others, he shared his ups and downs. We can all relate. I am an even bigger fan now. To know how he pushed on and competed in spite of how he felt, was moving, inspirational and sad all at the same time. I could go on and on about this story, but will save it for the listener to experience first hand. I have zero interest in tennis or this guy, but my father wanted to listen to it, so I thought I would too. What an amazing life story. 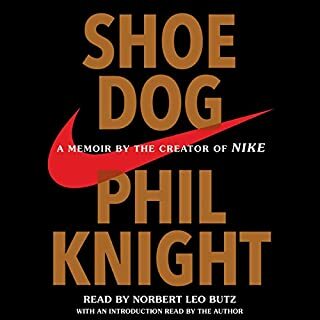 This is a great and easy listen for anyone, tennis fan or not. Totally worth a credit. My father loved it too. Agassi's book is awesome. It feels as if you have been in his tennis bag for 20 years. The stories and recollections are robust, and the narration is first rate. Just terrific. I like sports a lot, but was never a big tennis or Agassi fan. I loved every minute of this book though. It was SUPER funny, and extremely interesting at the same time. My favorite parts were the stories about his dad when Agassi was a child, and then about his pursuit of Steffi Graf. 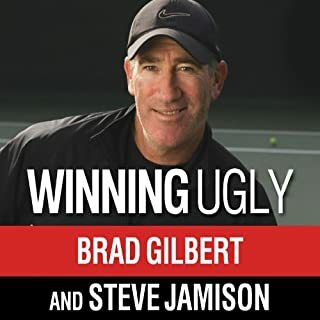 My favorite character was his coach Brad Gilbert, but there are so many great characters in this book. If I had access to a time machine, going back to spend time on the road with Agassi and his group of friends would be near the top of my list now. If you are remotely considering this book, I can guarantee you will not be disappointed, sports fan or not. I loved this book! 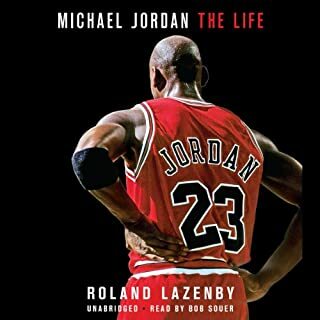 It was well written and moving, exciting sports recounts, a love story, and the struggles of the famous athlete. I had no real opinion of Andre but now am a big fan. I felt that I was carried behind the scenes into the mind of a super athlete. I am also very impressed with his "giving back" philosophy. Very worth listening to...great narrator too! I'm by far not the first reader of this book who never played tennis and really didn't pay attention to pro tennis while growing up. But - this book is absolutely compelling from start to finish. 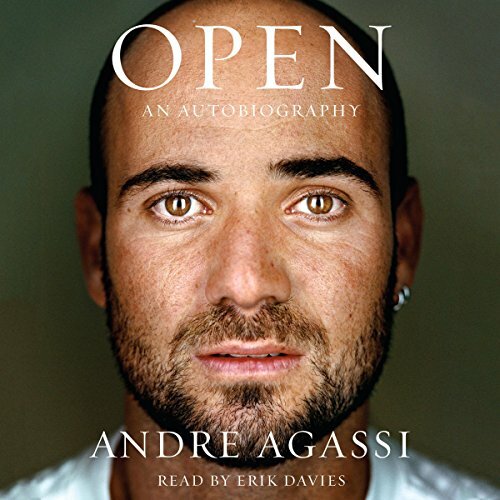 One of the best I've listened to and I've been an Audible member for 6 years at 2 books a month... Agassi is a very interesting person with an extraordinary story. His honesty is fascinating. I hated to turn this one off between commutes. Can't recommend a book more highly. Very, very well done.